PRINCIPALICTY OF ANDORRA: Recently we’ve visited some of the smallest, tiniest countries, called European Microstates, in Europe and each of them is very unique in its own way with some intriguing beauty and characteristics. Vatican City is the smallest of all with a historic city-like feelings in central Italy; Grand Duchy of Luxembourg is situated on several layers of hills close to Belgium, Germany, and France; Principality of Liechtenstein has Swiss Alps all around it but majority of the country is on the valleys bordering with Switzerland and Austria; and Principality of Monaco had some hilly areas, mountains, and serene turquoise Mediterranean Sea bordering one side of the country in French Riviera. Now, Andorra is completely different from all of them. The whole country is situated on giant size Pyrenees Mountains range in between France and Spain; I am talking about mountains with few thousand feet elevation. It’s fascinating to see how people adjust their lives according to their environments and atmospheres. When you are in Venice, it’s amazing to see how people go by their daily lives having water all around them…for us who live in regular city or village-like structure, this is unthinkable. 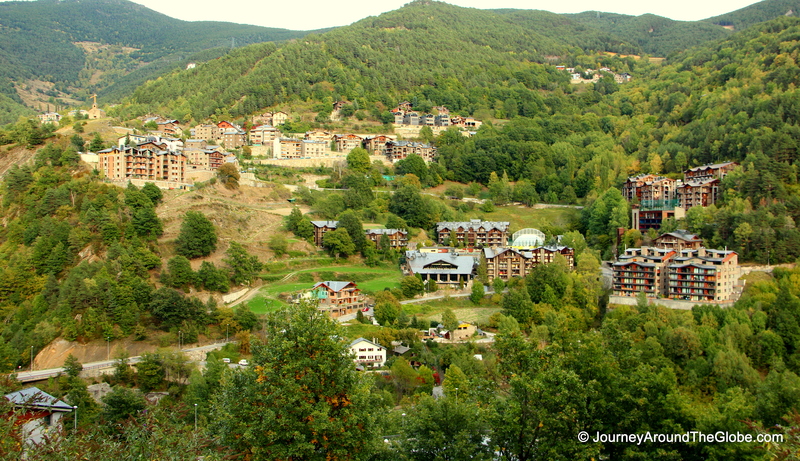 You can say Andorra is the exact opposite of Venice. Here, people have learned all the tricks and strategies to overcome the challenge of living their lives on these monstrous high landforms very easily. 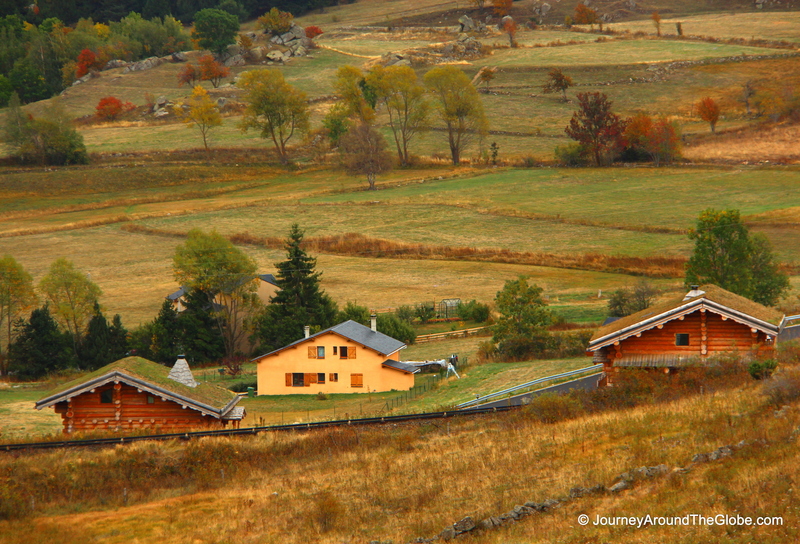 Andorra is an extraordinarily beautiful country with ultra-modern feel and look. 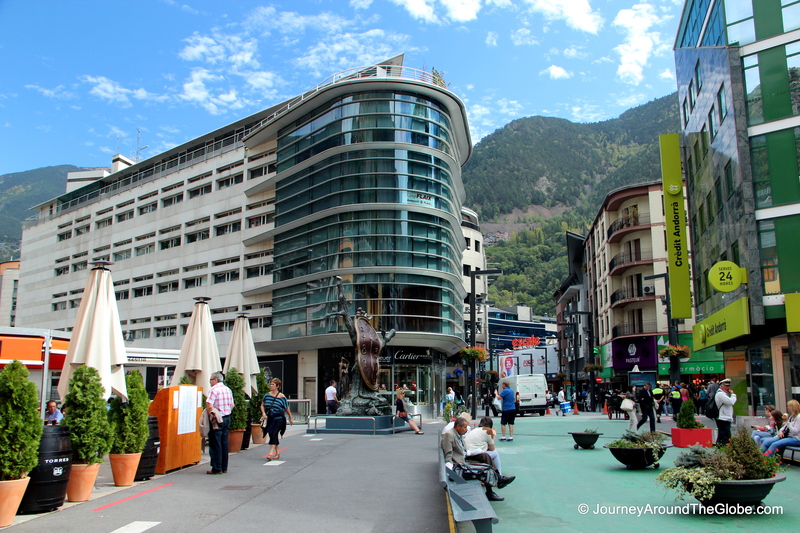 The capital Andorra le Vella is simply a breath-taking town with contemporary buildings and up-beat life style. 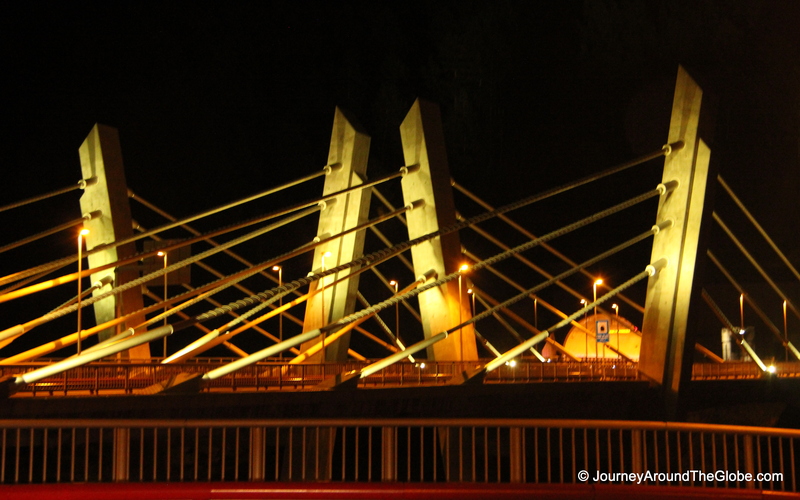 Check out the marvelous roundabouts on the streets when driving or walking…they are interesting and fun to look at. Andorra doesn’t have its own airport. So, the best way to get into the country by plane is via Barcelona/Toulouse in Spain or Montpellier/Perpignan in France. May be coming from Barcelona is a better choice since it’s about half of the driving distance of Montpellier. The official language here is Catalan for being so close to Barcelona, Cataluña, but most of them understand/speak French very well. But if you don’t speak either of them like me, don’t worry, almost all the locals speak excellent English. People here are very friendly too…our GPS couldn’t direct us to our hotel properly and this nice elderly lady actually drove us (we followed her car) to our hotel. 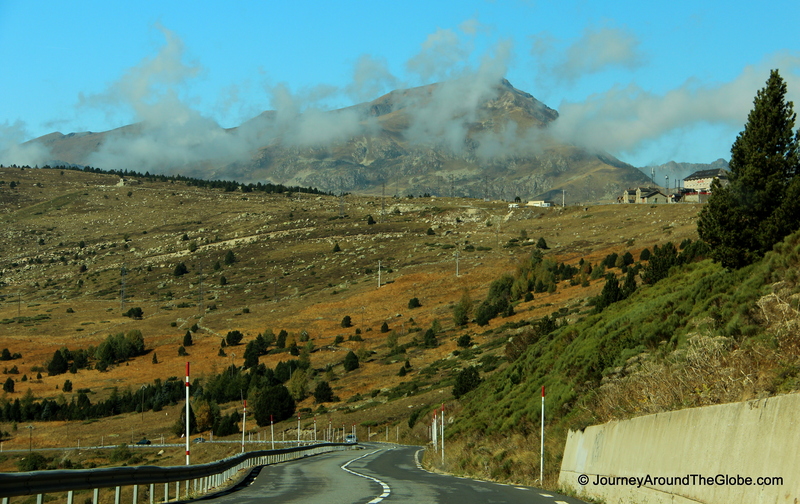 TIME OF OUR TRAVEL: We drove from Montpellier, France and took us about 5 hours to reach Andorra. It sounds like a long drive, but when you are driving thru small villages on zigzag hilly roads with beautiful rugged ice-caped mountains hugging the clouds, you only wish this sight never ends. The weather was great, nothing to complain about. But when you are on few thousand feet elevation, it gets a bit chilly when the sun is playing hide & seek during day and may be little colder when he is not there at all after dark. Andorra is a very famous destination during winter too for its well-known ski-resorts and many winter activities. OUR HOTEL: We stayed in a hotel in a small city called Sispony, about 10 minutes drive from Andorra le Vella, name Abba Xalet Hotel Suite. This 4-star hotel itself was on a small hill and had a picture perfect view from our room. It didn’t have free breakfast, but free Wi-Fi was just fine for us. Apart from the beautiful setting of our hotel, I think, 99% of the hotels here have mind-blowing view of Pyrenees Mountains or the nearby valleys and small towns. There are mountains and more mountains everywhere… what better things you need when in a vacation? SHOPPING & EATING: Everyone will say Andorra is a shoppers’ paradise because it’s a tax-free country… and honestly, IT IS. Oh, if I could only carry a big suitcase with me in the plane without paying extra money, I would have bought bunch of stuff from here. Electronic goods are something very common that people usually buy from here along with designer perfumes, make-ups, watches, and many more things. Although we really didn’t try any local dish from here other than some tapas, but from what I’ve seen, you can get Catalonian dishes here very easily, like paella, gazpacho, and variety of tapas. 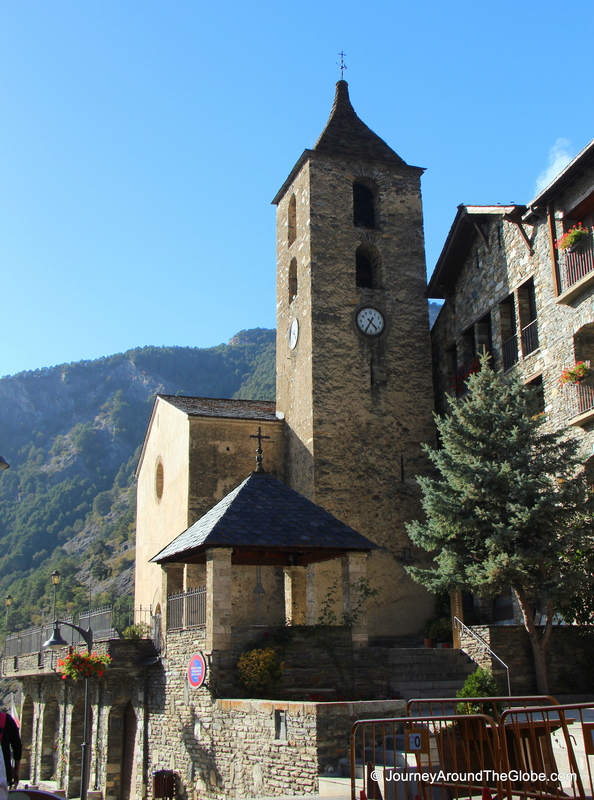 PLACES WE’VE VISITED: We arrived here one evening and spent the next full day in Andorra le Vella (the capital of Andorra) and in Ordino (another small village of Andorra). 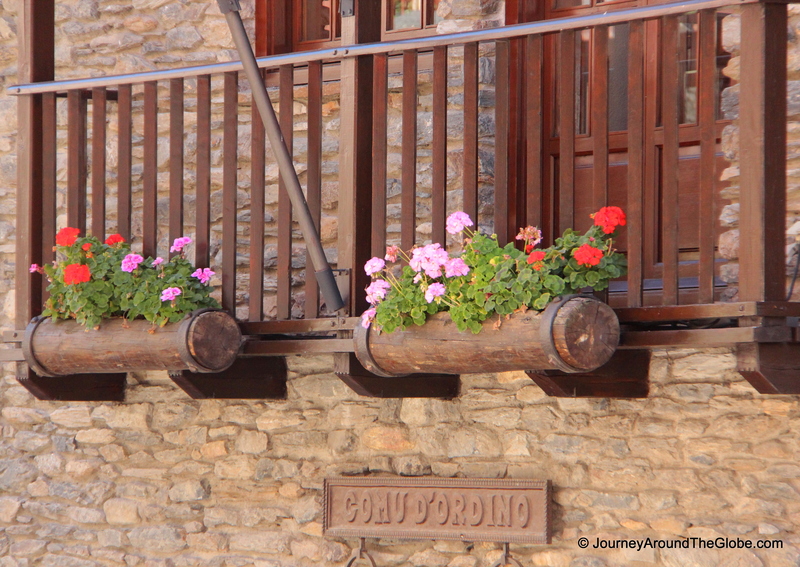 I assume almost all the villages here are charming, like Ordino, with splendid view of Pyrenees in all directions. 1) ANDORRA le VELLA: The capital is divided in 2 parts: older half with narrow & winding streets and the newer section which is very commercial with lots of shops and modern buildings. 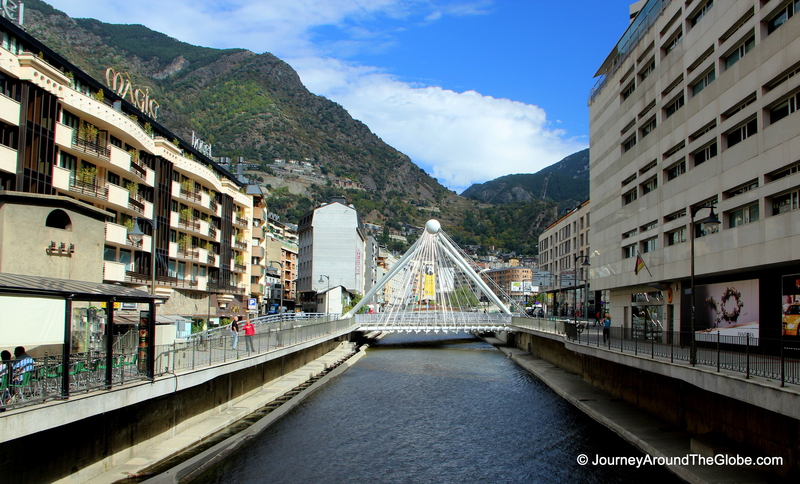 Walking on foot around the city is the main excitement in Andorra le Vella, don’t worry you don’t have to go up and down on the mountains here. But if you want to save time you can also catch local bus from one end to the other. We parked in a garage called “Placa del Pablo” in Andorra le Vella, which was very close to most of the attractions of the city. 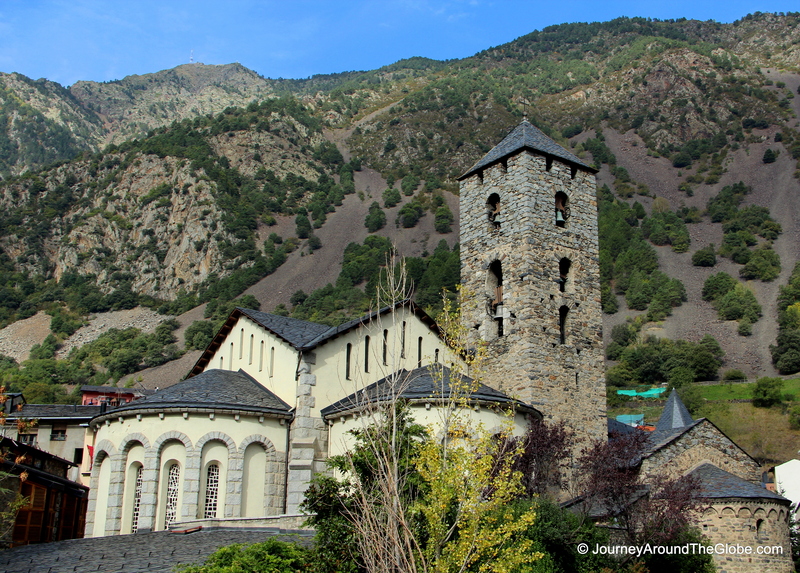 a. SANT ESTEVE CHURCH: This church dates from the 12th century and stands in the historic old part of Andorra le Vella…a true example of traditional architecture of this region. b. CASA de la VALL: Walking thru the older part of the town from Sant Esteve Church to Casa de la Vall is very cozy. Casa de la Vall is a historical house of Andorra and headquarters of the General Council of Andorra from the 16th century. 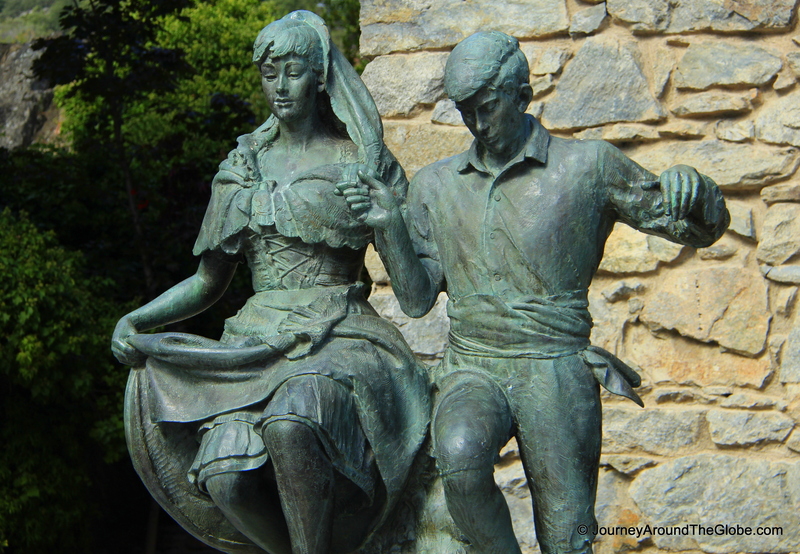 The location is very refreshing here with an overview of the surrounding valley and hills, and oh, don’t forget to check out the statue of a boy and a girl in one side of the Parliament. c. MERITXELL: This is a long stretch of street and a heaven for those who like to SHOPPP. Yes, as I mentioned before Andorra is a tax-free country and you can literally go goo-goo-ga-ga on all the shops on this street. I highly recommend going on foot from one end to another. Extend your stay in Andorra if you have to, because you will need some time to drool on all the stores here. Electronic stores are everywhere on Meritxell. But you will also see designer perfume & make-up stores, shoes, clothes, watches, and everything else that I forgot to mention on this lively street. But be careful, they are very close to Spain and therefore, take a “Siesta” (afternoon break) from 2 – 4pm when most of the stores, not all, are closed and then re-open again from 4 – 8 pm. We saw some restaurants and cafes here, but had our lunch in KFC/Pizza Hut on Meritxell for something quick and easy. 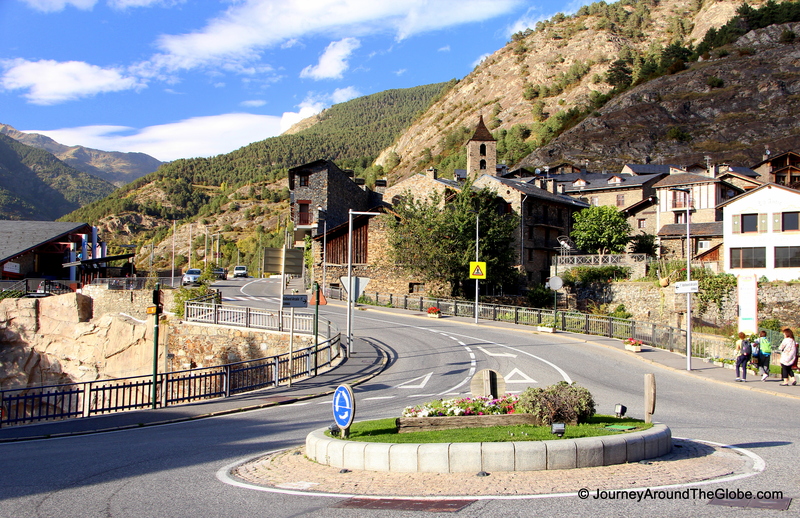 2) ORDINO: Ordino is a nearby small village and only 5/6 miles (15 minutes drive) from Andorra le Vella. It wasn’t in our itinerary but a local mentioned if we have time we should go check it out. It was well worth the trip, although we reached here late afternoon and most the museums and stuff were ready to close for the day. Parking is not a problem if you are driving, you will see paid garages and some free parking very close to Sant Cornelli & Sant Cebria Church. a. SANT CORNELLI & SANT CEBRIA CHURCH: This is a very small parish church on a hill. It was initially built in the Middle Ages and considerably remodeled between the 17th and the 19th centuries. Inside there is a Romanesque statue of the Virgin Mary made of polychrome wood, dating from the late 11th and early 12th centuries. This virgin is distinguished for being one of the smallest in the Principality, at just 44 cm high. The church gates are also from the 17th and 19th centuries. The altar is small but gorgeously decorated from around 17th century as well. b. CARRER MAJOR: This is the main street of the village close to Sant Cornelli & Sant Cebria Church and offers a pleasant stroll from one end to the other. There are couple souvenir shops, cafes/restaurants, old architectures, and finally lotsss of stray cats on this street. It’s a nice place to spend some time in the late-afternoon for some drinks and just enjoy the mountains from a distance. I’m so glad you posted this as I will be visiting Andorra in a month and a half and had no idea what in the world to expect! Boy oh boy did I just get excited! Thanks so much for your informative post. 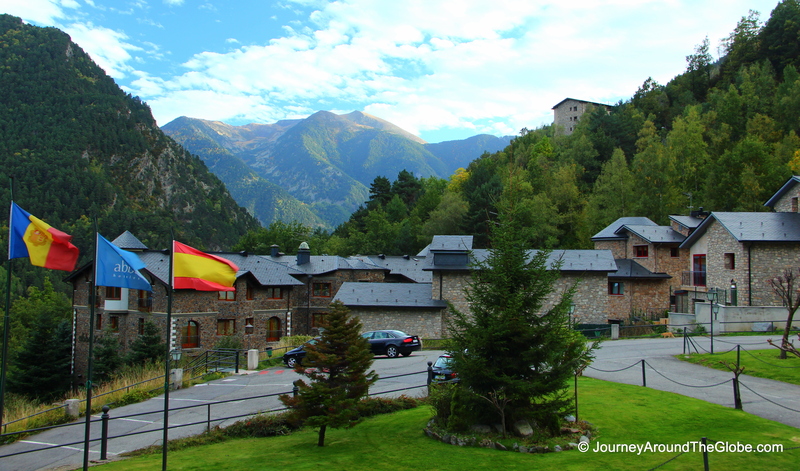 I’ve always wondered what Andorra was like – it always sounded like someplace in a fairy tale. Beautiful. What a beautiful place in the mountains. I never seem to get tired of the towering rocky mountains. All that fresh mountain air- looks wonderful! Sounds like a really awesome place to visit. They look like beautiful clean places. Nice one! One of the places on my list of future trips, thanks for the detailed information.